Here’s a fun essay I wrote for Graphic NYC about the movie ONCE UPON A TIME IN AMERICA and how it influenced my book, BROWNSVILLE. Have a read and immerse yourself in one of the finest mob films ever made. It’s the fifth night of Chanukah, so from our yet-to-actually-be shoveled (whew!) relocated home office in New Jersey, Team Kleid wants to wish you and yours a safe and happy holiday season. Thanks for supporting THE BIG KAHN in 2009, and here’s looking to a brand new year filled with health, happiness, success and sequential excellence. Author Neil KleidPosted on December 15, 2009 Categories BlogLeave a comment on Happy Holidays! Howdy! The holiday season is upon us and as you race through your Black Fridays, Gloomy Back-to-Work Sundays and the like looking for that perfect gift to stuff yer stockings or brighten your menorah, might I suggest the perfect gift? Yes, that’s right! Pick up a copy of my latest graphic novel, THE BIG KAHN (with Nicolas Cinquegrani for NBM Publishing) and give your friend, family member, boss or lover the gift of sequential drama. And if you’re in the New York/New Jersey area, personalize your gift by joining me at Jim Hanley’s Universe in Manhattan on December 3rd from 6PM to 8PM for their End of the Year Spectacular Blow Out signing! I’ll be signing copies of THE BIG KAHN, BROWNSVILLE and more with my pals Stuart Moore, Fred Van Lente, David Gallaher & Steve Ellis, each incredible talents whose books would make great gifts, as well. If you’re not in the area and can’t make the signing, please consider THE BIG KAHN as a holiday for friends and family, as well. It’s a drama about loss, lies, belief and renewal and a graphic exploration of a family secret so well-hidden, even the family didn’t know about it until it was too late. Check out previews and reviews of both KAHN and my first book, BROWNSVILLE, at the NBM site. Thanks for considering the book… and looking forward to seeing you at Jim Hanley’s on the 3rd! Yes, it’s true — next weekend I will be flown out as a guest of this year’s Miami International Book Fair to take part in their Comix Galaxy programming, presenting THE BIG KAHN (despite the website calling it ‘Great Kahn’) alongside Eisner-nominated cartoonist Brian Fies on Sunday, November 15th at 1:30PM and then signing books following our talk. I will also be teaching an exclusive minicomics class at Miami-Dade College on Friday, November 13th, and will be walking around the Fair saying hello to friends and checking out the amazing lineup of authors. The fair takes place November 8-15, with the street fair starting on the 13th. There’s a pretty impressive list of participants including Al Gore, Iggy Pop, Rich Cohen (I’m gonna try and talk Jew gangsters with him! ), Jonathan Lethem, John Hodgman and graphic novelists like Josh Neufeld, Dan Goldman, Josh Dysart, Carol Tyler, James Sturm, Jimmy Gownley, Bob Sikoryak, David Small and more. If you’re in the area, please come by and check it out. Okay, that header wasn’t so family friendly. But THE BIG KAHN is, and we got a great review at Bookgasm. There’s also a great little interview with Nico here. Check it out! Have a read, why doncha? Hey, New Jersey—I’ll be signing copies of THE BIG KAHN (among other selected comics I may have perpetrated random acts of sequential violence) at A&S Comics and Cards in my hometown of Teaneck, New Jersey this Sunday, October 25th, at 12PM. Swing by on Sunday, October 25th to pick up and talk about comics, get stuff signed, get something sketched and generally have a great old time. 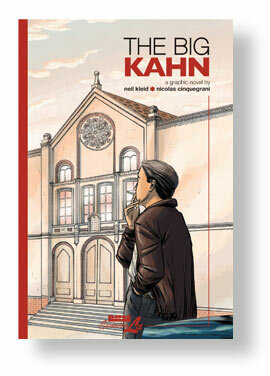 THE BIG KAHN is a Good Comic… and Comics SHOULD be Good! Mastery of the craft. You heard it here first, sports fans. Author Neil KleidPosted on September 14, 2009 Categories BlogLeave a comment on THE BIG KAHN is a Good Comic… and Comics SHOULD be Good!